Officially open for classes this spring, the Oechsle Center for Global Education is a dynamic, collaborative learning environment-a physical intersection for programs and majors that deal with all facets of global education. 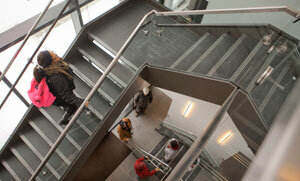 The same can be said of the two programs also housed in the building-Africana studies and international affairs. For instance, many students who take classes in Africana studies are anthropology and sociology majors, notes Wendy Wilson-Fall, associate professor and chair of Africana studies. With both areas of study sharing the same space, there is greater potential overlap for students. Students in Africana studies who want to stay focused on that field are encouraged to take classes in international affairs. Those who are more interested in diversity issues in the U.S. are encouraged to take sociology courses. The shared spaces, particularly the Global Salon on the second floor, are already very popular among students and faculty as places to meet or spend quiet time reading and working. The center is also quickly becoming a hub for international programming for the entire campus. Journalist Deborah Horan recently finished a week-long residency as the Woodrow Wilson Visiting Fellow for Oechsle Center’s inaugural year. For more than a decade, Horan covered the Middle East for the Houston Chronicle and Chicago Tribune. Her stay, which was supported by The Andrew W. Mellon Foundation, included classes, seminars, workshops, lectures, and informal discussions with students and faculty. Professor Wendy Wilson-Fall teaches the course Social Transformation and Environmental Justice in the new Oechsle Center. Wilson-Fall is organizing a roundtable forum this fall to discuss new theoretical frameworks for studying U.S. African American communities through time in comparative contexts with other similar communities in the Americas. The two-day forum will feature faculty from history, international affairs, and anthropology & sociology, as well as faculty from other institutions and student participants. The forum’s second day will be open to the entire college community. The three-story center, located along South College Drive overlooking Easton, was made possible by the support of trustee emeritus Walter Oechsle ’57 and the late Christa Huber Oechsle. The $10.6 million facility includes a 60-seat lecture hall, two 40-seat classrooms, and a conference room. The Global Studio and the Global Salon can be configured in many ways for teaching, learning, and special events. 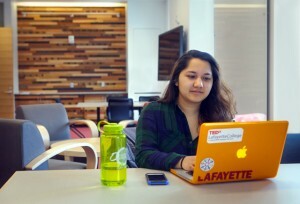 Nirupa Basnet ’17 takes advantage of one of the new study rooms. Wooden panels, like the one behind her, are featured throughout the building. The use of salvaged lumber from around the world in the center promotes local and recycled materials and reflects the global focus. A formal dedication ceremony was held March 27. It featured remarks by President Alison Byerly, Edward Ahart ’69, chair of the Board of Trustees, Wilson-Fall, and Kameliya Yordanova ’18 (Plovdiv, Bulgaria), who is the recipient of support from an endowed scholarship fund established by the Oechsles to benefit international students at Lafayette. Bissell points out that the generosity of alumni like Walter Oechsle often leads to more generosity. Coinciding with the Oechsle Center is the new endowed Ethnographic Research Fund, which will “provide funding for students studying anthropology and sociology to participate in field study and ethnographic research focused on global concerns.” The fund’s donors wish to remain anonymous. A plaque in the Oechsle Center honors donors to the Class of 1961 International Speakers Fund. The class members established a permanent endowment for the fund in celebration of their 50th reunion. The lecture series brings to campus policy-makers, scholars, and others whose work deals with contemporary issues in international affairs. Pleased that our Class of ’61 and especially its leaders have been able to participate in an International Speakers Fund. 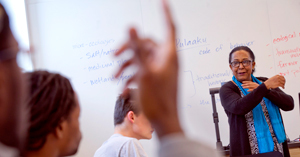 Very important that students hear views – even if diametrically opposite of theirs or others.